Dump Truck Services - Aqua-Tex Transport, Inc.Aqua-Tex Transport, Inc. - Hammonton, NJ Dump Truck Services - Aqua-Tex Transport, Inc.
Let us make your lives a little easier. 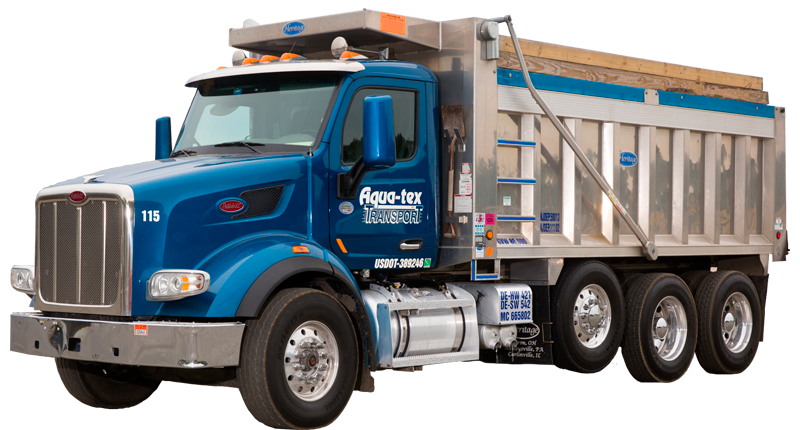 Aqua-tex Transport can provide the hauling and disposal services needed to complete any job. We guarantee proper and responsible disposal of any and all wastes that you might generate during the course of your work. By lumping our services together we are able to provide you with some of the most competitive prices around. Having both steel and aluminum bodied tri axle dump trucks and trailers gives us the flexibility to offer you a lightweight vehicle to haul as much material as possible, or a heavy duty truck body to haul large stone or concrete demo. When hiring an Aqua-tex Truck not only should you expect well maintained, new trucks, you should also expect them to come with experienced operators. All of our drivers have years of experience paving, hauling dredge, hauling materials such as sand and stone, ID-27 soils, construction debris, and much more. We also have a variety of drivers with specialized endorsements such as HAZMAT, and TWIC cards available to ensure responsible handling of your material. A fully licensed, full service transportation company. See below for a partial list of our permits and certifications.